We all know that automation is bad, right? Setting something on autopilot and just letting it run can often lead to disastrous results. Smart (and selective) automation on the other hand can help to improve productivity and allow you to focus your energies elsewhere. I am a big fan of IFTTT, and use it to automate tasks for certain parts of my job, leaving me free to get on with other things. But WTF is IFTTT? The creators of IFTTT describe it as putting the internet to work for you. It is made up of channels (71 and counting) that you activate. 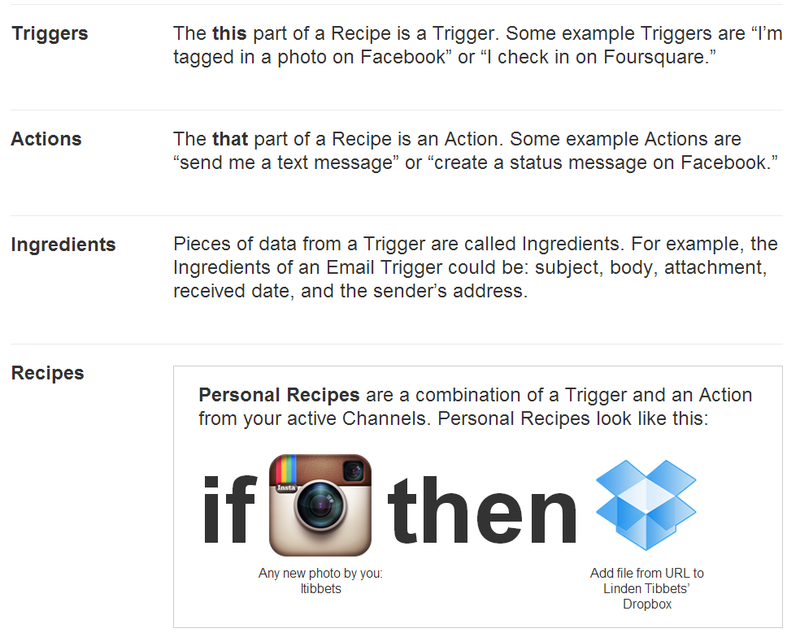 From there you create recipes based on triggers and actions. Basically when one trigger from a channel is activated, it creates an action in another. There is a wide range of recipes that you can create to make your work that little bit easier, and with a bit of creativity, you can create a series of these recipes that will work for both personal, and business use. Check out this recent presentation from Wil Reynolds to see how a little creativity can go a long way to helping you as an SEO or online marketer. Getting started with IFTTT is easy. As a guy that likes to dig through stuff and pick out the best bits, I have curated some of the most useful recipes I could find (there are tens of thousands of them on the site). What follows are some recipes that you can use to get you started with IFTTT – most of which have got some relation to the world of SEO and online marketing. Notes: Allows you to have a archive of potential images for blog posts – tage them correctly on a regular basis and you are on to a winner. Notes: Creates a daily note for your daily goals. Users can create checkbox or bullet point task list. Notes: This Recipe searches for incoming Gmail with the word “Receipt” or “Order” in the subject. When it spots a new one, it adds a row to your Receipt Spreadsheet along with its first Attachment! Automated organization, cool. Notes: Edit the Dropbox folder path to your liking! Notes: Replace username (“thatgirlcrystal”) in Pinterest link with your own. Replace “feed” with specific boards or leave it as it is for all pins. I’m personally using this recipe to track my pins for a ‘This Week In Links’ feature on my website. Notes: Automatically publishing my blog posts on scheduled tweets at optimized hours. Notes: This recipe will add a row to a Google Spreadsheet for every new check-in; maps included! Notes: I wrote a PHP script that makes an RSS feed from news items in my site’s database. This recipe checks the feed and posts new items to the site’s facebook page. Notes: Instagram doesn’t seem to allow uploading directly on Facebook PAGES, only personal walls. Notes: Go to http://gplusrss.com/ and follow instructions. Then copy the rss feed link to the trigger.